Oby, the girlfriend of famous singer, GT Da Guitarman obviously didn’t wait in vain. 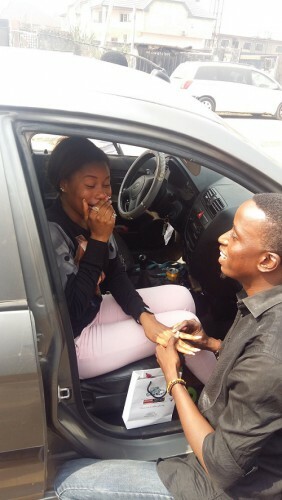 After dating the singer for 6 years, GT with real names as Gbemiro Tokunbo took Oby to where they met 6 years ago and asked for her hand in marriage by proposing to her right on his knees. In a chat with Showtime, GT explains why he chose Oby out of so many girls dying to be his and how coming from different tribes can’t hinder their LOVE.